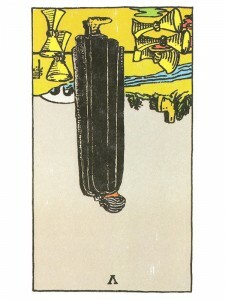 Five of Cups (R) suggests that your emotional state has turned to sorrow as a result of this disappointment. You feel as if your dreams have been dashed and broken. Think carefully before making another major decision – you can not change what has happened. Continue to believe that the obstacles to love can be overcome – that you have only experienced the limitations and there is still hope. Allow your tears to flow and question what you have learned from this experience. Tomorrow brings a new dawn and things will look better as courage blossoms from your broken dreams. Life is never what it seems – there is always “hope” – this experience is not the end but an opportunity for a new beginning. Focus on happy news – make a conscious effort to let go of this disappointment. Focus all your energy on a new beginning – consider a new home or working environment and start building new ideas. You have learned well from past experiences – accept your loss and accept the support from others. Look forward to new friendships, new interests and new occupations. Take time to “see” what remains important to you even in the face of this sorrow and pain – focus on what remains for it is the solid basis of your life. On the negative side of this coin are things like carelessness, inconsiderate of others feelings, frivolous behavior, emotional immaturity, wasting creative potential, unharnessed energy – looking at the emotional/creative losses instead of gains. The glass is seen as half empty rather than half full. Next to Devil: You need to reconsider everything. It is time to get back on track and stop wasting your energies. In the first position: Although you guard your independence of lifestyle, preferring to go your own way, you may find yourself in frequent diversions fighting for the same lifestyle for others. An ironic twist for your Karmic Contract. In the second position: Be sure that your support systems are not too diverse or too scattered and that you have the means to coordinate and draw on them all efficiently. Guard against fragmentation and duplicity. In the third position: One or more of the distortions of this archetype will be centered now as energies and entities catch up to one another. In the fourth position: Neither be wooed into giving up your freedom completely, much less enjoying restriction or imprisonment, nor be so footless and fancy free that you miss the lessons of this archetype altogether. In the fifth position: In one extreme, you are so oriented to your freedom and the future that you may be leaving something important behind. In the opposite extreme, you are not as free as you should be, preferring to look backward, hanging onto issues that are truly finished except in your mind. Any of the distortions could creep in here – guilt, frustration or depression. In the sixth position: You may not see this emotional/creative breather as such a positive light. If there is heartache here – it may be over the loss of something you never really had. There is also the possibility, in the opposite vein, that you have lost something of value and are oblivious to it. In the seventh position: What now? The question may strike fear in your heart but this is the time for rethinking your emotional/ creative world. Get over yourself and over others if need be, in order to get on with things. In the eighth position: At this point you may be feeling one of two extremes: that you are profoundly affected and having trouble adjusting to the glitch in your Physical Plane or that you are unaffected, even glib and not taking appropriate stock of what has happened. In the ninth position: The heart is impatient to realize its desires. Be cautious here neither to rekindle issues left in the past, nor to try and jump start situations that are not for you. In one extreme, this can be enormous heartache. In the opposite extreme, a more callous heart feels little at the loss of something or someone valuable. In the tenth position: One or more of the distortions of this archetype will be aligned with grace in order for you to maximize the lessons of your Higher Emotions.